During 2017 we witnessed an unprecedented boom in the adoption of tokens. An event that was shortly followed by a massive sell-off of these assets in January 2018. These occurrences left us with many questions, most still unanswered. One of the key questions we noticed was, how do you value these tokens? In this article, we present a valuation approach for tokens which has been developed in collaboration with academics such as Andrea Buraschi, Chair in Finance at Imperial College London and industry experts Saswata Basu CEO 0Chain and Mohammed Siam COO 0Chain. We will discuss our valuation approach, the company 0Chain, an equilibrium methodology developed to solve for the price of goods and services based upon market conditions and how the medium of exchange principle is applied to mathematically determine the ZCN token value. This study should not be perceived as investment advice. All the documentation has been developed for educational purposes. We kindly ask that you read the disclaimer in the final paragraph of this article carefully. For questions, feel free to contact me at sebastiaan.vervest17@imperial.ac.uk or at https://twitter.com/SebastiaanVerv1. To mathematically calculate the ZCN token price, we apply the medium of exchange principle (Buterin, 2017). This principle determines network value by total money supply; in this case number of tokens (M) multiplied by the velocity of money/tokens (V). The solution of this multiplication should be equal to the price of goods and services (P) multiplied by the economic value of the transactions (T). The equation is M * V = P * T.
The price of the token (C ) can be determined by the quantity of goods and services (P) that can be purchased with 1 ZCN token. Therefore, the price of the token (C) can be formulated by 1 / P. Applying this formula to rearrange the medium of exchange equation provides us the following formula: M * V = 1/P * T or C = T / (M * V). To solve for the token price (C), we need to calculate the price of goods and services (P), token velocity (V), the number of tokens (M) and the economic value of transactions (T). To solve for the price of goods and services (P), we developed an innovative equilibrium methodology based upon supply and demand market conditions because 0Chain’s current function/use case, providing decentralized storage storage, is a marketplace between two parties. An equilibrium methodology is required to determine the price (P) of transactions. For the other components of the medium of exchange principle, we hold detailed assumptions for token velocity (V) and the 0Chain token design has set a fixed amount of tokens (M), also known as supply. We apply an adoption curve using Bass theorem to forecast the demand or economic value of transactions (T). 0Chain is a novel blockchain network that provides fast, secure, flexible and free services on the internet. The company solves common speed and scalability problems with blockchains by having developed a new consensus mechanism. The blockchain system is composed of three parties. These are miners, sharders and blobbers. The miners validate the transactions, the sharders store the blocks, and the blobbers store the unstructured data. Every party is divided into three groups, for example; primary miners, secondary miners, and bench miners. A shuffling consensus mechanism among these groups along with a self-forking ability enables 0Chain’s blockchain advantages such as its speed, security, and flexibility. One of the products that 0Chain will offer is online cloud storage. With every ZCN token (C), depending on its value, gigabytes of cloud storage per period can be purchased. One gigabyte of cloud storage per period can be defined as the price of goods and services (P). The online storage will be provided by the blobbers in the network. Clients are described as parties that purchase tokens for their utility benefit. Blobbers are required to stake tokens to provide storage services on the 0Chain network. This prevents blobbers from malicious activities. Clients can purchase services on the network through buying the ZCN token or locking purchased tokens to the blockchain to earn new tokens. Clients can use these tokens to reward blobbers for their services provided. The locking ability offers clients the opportunity to gain free access to the blobber services. Blobbers are also rewarded for staking tokens. The amount of rewarded tokens distributed among the locking and staking parties is set by the inflation rate. In the 0Chain network we can define a main market and sub-markets. On the main market parties can purchase and sell ZCN tokens, essentially the token market. In the sub-markets, parties use the ZCN tokens to gain access to services on the network. At the moment 0Chain only has a market for decentralised storage but multiple markets (and use cases) can be foreseen given the versatility of the 0Chain network. In these markets there are parties that offer services and parties that desire services. In order to perform a transaction, a price must be determined that satisfies both parties constraints. Therefore an equilibrium methodology is required to solve for the price of the service (P). Based on the economic functions of the interacting parties in every new market/use case, a new price (P) needs to be determined to calculate the economic value of the transactions (T). 0Chain will distribute in total 160mn ZCN tokens, of which 40mn tokens have been distributed in its initial coin offering. The system design includes a reward cap of 10% of the total token supply. This is the total number of tokens (M). At the time of writing, the ZCN tokens are trading at a total market capitalization of $3.6mn, with an average of $10k economic transaction value each day. To mathematically determine the price of a token (C), we need to calculate the equilibrium price (P), also described as reward in this article, resulting from interacting markets and their economic functions. In 0Chain’s case, the interacting markets are blobbers that provide storage services, clients that demand storage services and speculators that invest in digital tokens without requesting services. The main economic functions are the blobber profit function and the client participation function. These functions include assumptions about competitor prices, blobber costs for services provided, client utility benefit, cost of capital for blobbers, clients and speculators and multipliers to determine the required blobber stake and client lock. The functions basically answer two fundamental questions; what is the required compensation blobbers should receive to be incentivized and what are conditions for clients to purchase the network services. The BICC describes that the reward provided to blobbers must be sufficient to offset their capital expenditure and opportunity costs (B — B’ line). The CDC illustrates the costs to clients to purchase services which need to be competitive given outside opportunities (C — C’ line). The ICC details that investors who do not purchase network services must be indifferent between holding tokens versus other financial assets that provide an expected return (S’ line). 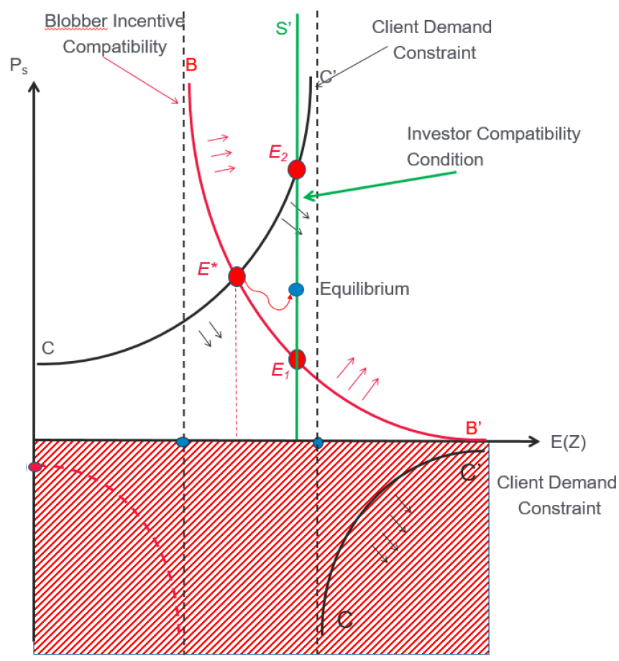 The graph below illustrates the constraints and the Capital Market 0Chain Equilibrium area which is detailed between the green S’ line, the C-C’ line, the B-B’ line and the right dotted line. The equilibrium reward is detailed by the blue dot. The equilibrium reward can vary depending on the bargaining power of the blobbers and the clients. If the demand for storage services is higher than the supply, blobbers have stronger bargaining power, and the equilibrium reward should increase (move up to E2). If the demand for storage services is lower than the supply, the converse occurs. The equilibrium reward would decrease (move down to E1). We want to analyze the equilibrium reward for sequential periods. During these periods, the assumptions for the incentive compatibility constraints and the economic functions may change. These are assumptions such as decreasing blobber costs, changing competitor prices and required staking and locking. Therefore, the equilibrium reward over time emerges from a sequential equilibrium set for every period. The sequence occurs as illustrated in the figure below. This methodology introduces a market mechanism that include blobbers, clients and speculators to determine the equilibrium reward that satisfies incentive compatibility constraints of these parties. This provides the price level of goods and services (P) which is required to calculate the ZCN token price (C). To mathematically calculate the ZCN token price, we integrate three different methodologies. We calibrate an adoption curve for cloud storage demand to forecast the economic value of transactions (T) using Bass theorem. The new equilibrium methodology developed for this study determines the price level (P) and using the medium of exchange principle we can calculate the ZCN token price. The calibration of the adoption curve calculates the amount of storage demanded by 0Chain customers for its 0Box and storage services. We apply the Bass model to calibrate the adoption curve. Bass developed a theorem that describes the adoption rate of new technologies and their network effects in a S-curve. Market research forecasts that the public cloud market is expected to grow 42.4% CAGR to 971 Exabyte in 2021 and 4.2 Zettabyte in 2030. Plotting this data combined with 0Chain estimates, we forecast that 0Chain will provide 510 petabytes of storage in 10 years. Second, the equilibrium methodology as previously discussed is modeled to determine the price of a gigabyte cloud storage per period (P). This model includes multiple sets of assumptions regarding costs and multipliers. The model is designed to include the sequential equilibrium and has the BICC, CDC and ICC constraints integrated. The equilibrium price for a gigabyte of storage per period (P) is determined on supply and demand market conditions, which are introduced by the bargaining power in the model. When the bargaining power is 1, blobbers have strong bargaining power and the equilibrium price is higher (E2). When the bargaining power is zero, clients have the bargaining power and the equilibrium price is lower (E1). For this study, we assume an equal bargaining power between clients and blobbers. Once the equilibrium reward (P) is calculated, we can determine the blobber profit function and the client participation function. An inflation rate function, included in this model, determines the amount of new tokens rewarded to blobbers that stake tokens and the client lock tokens. The inflation rate is set at 10% while multipliers are set at 10. This signifies that parties earn a 10% return solely on staking and locking (excluding earnings on token price growth). This influences the total token supply (M). There is a cap of 10% new rewards per period based on the previous period total token supply. Third, the token dynamics are modeled which contain all the components for the medium of exchange equation used to determine the price of the ZCN token. As we have already discovered the equilibrium price of the cloud storage service (P), we need to determine the economic value of transactions (T), the total number of tokens (M) and velocity of tokens (V). 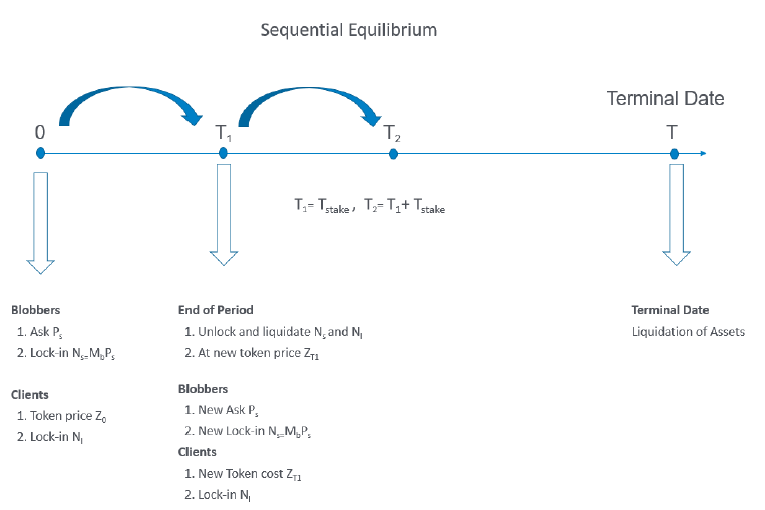 Calculating the economic value of transactions (T) requires the integration of the calibration of the adoption curve and the equilibrium price (P) from the equilibrium token reward model to forecast the economic value of the direct-, stake- and lock transactions. The demand also composes of speculators, in which we define two types of speculators. These are speculators that hold tokens a more extended period and those that hold tokens for direct trading (shorter hold). The total number of tokens (M) is determined by a fixed amount of tokens of 160mn in the token allocation schedule. The token rewards are provided by the 0Chain system for the tokens staked and locked determined on the forecasted economic value of transactions (T). The rewards are capped at 10% of the total token supply in the given period. A weighted average token velocity (V) is calculated based on the party utility period. In the 0Chain network there are three parties. These are parties that perform direct transactions and that stake-, lock tokens where the velocity is equal to the cloud storage period. The other parties are long term- and direct trading speculators. Long term speculators decrease the token velocity as they hold tokens longer. Direct trading speculators increase the token velocity due to continues trading. The forecasted trading activity is based on actual trading activity with an adjustment for size. This information is plotted in the token schedule. The token schedule derives the current token price from Coinmarketcap and forecasts the token price (C) based on the developed valuation model. A solver is applied to to calculate the maximum token price given the constraints of the 0Chain system design. For the financial model we refer to the excel model in the google drive. This study forecasts that the ZCN token price (C) should increase from $0.09 per 15th of March 2019 to $1.62 in 2024. The token price increases due to the economic value of transactions (T) outpaces the total token supply (M), even with an increasing velocity (V) which reduces token price growth. An interesting finding in this study is that we have found that doubling the storage demand forecast does not induce a doubling of the token price. The higher token price reduces the increased demand for tokens and thus constrains token price growth to a 33% increase. Symmetrically, a 50% drop in the storage demand forecast induces a lower predicted token price but not by half. The forecast token price would drop by 26%. For other interesting findings, we refer to the application paper in the google drive. This is the first study that has developed and applied an equilibrium methodology to determine an adequate price level (P) of goods and services to value 0Chain’s ZCN token. We believe this equilibrium methodology is essential because these new systems will enable more markets on which parties can interact with each other. For these parties to interact an equilibrium mechanism is required to discover a price (P) in which transactions can be executed while satisfying the incentive compatibility constraints of these parties. Once the adequate price (P) is discovered, the other components in the medium of exchange formula can be plotted to calculate the token price (C). In conclusion, this mathematical valuation model provides the blockchain community useful insights in how these token systems can generate value for all interacting parties. This model will greatly strengthen the adoption of token systems because it provides vital information for any decision making unit involved in purchasing or selling tokens: what should the current price of the token be and what are the main determinants that can impact the token price. Therefore, we believe that studies like these are fundamental to design sustainable token systems for the future. This study provides no investment advice. The content of the article and/or papers are for informational and teaching purposes only: you should not construe any such information or other material as legal, tax, investment, financial, or other advice. Nothing contained in this article or papers constitute a recommendation for and/or endorsement to buy or sell any securities or other financial instruments in 0Chain or any other blockchain firm. None of the authors, in whatsoever, can be responsible for your use of the information and methodologies contained in this paper. The authors assume no responsibility or liability for any errors or omissions. All information contained in the article and/or papers is provided ‘as is’, with no guarantee of completeness, accuracy, or of the results obtained from the use of this information.